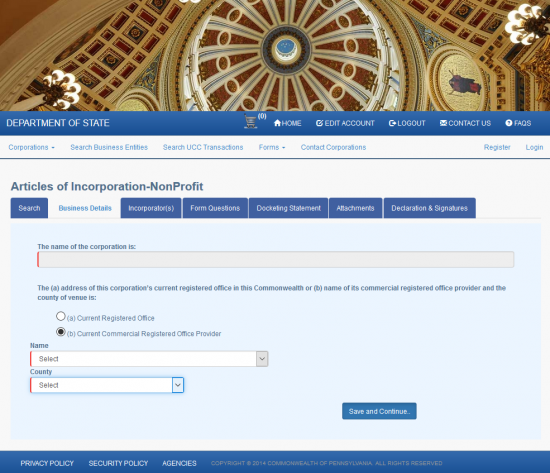 The Pennsylvania Articles of Incorporation Nonprofit Corporation | Form DSCB: 15-5306 is the form template utilized by the Pennsylvania Bureau of Corporations and Charitable Organizations to gather the basic information required of Incorporator(s) regarding the nonprofit cooperation being formed. This only satisfies the formation and registration requirements the Pennsylvania Bureau of Corporations and Charitable Organizations has set forth and, by no means, fulfills all the requirements of all government agencies. 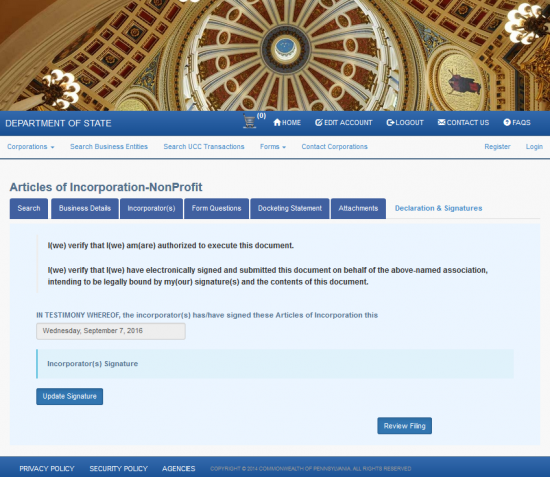 This means that other governing bodies will have their own requirements – sometimes in conjunction with the submission of the Pennsylvania Articles of Incorporation Nonprofit Corporation | Form DSCB: 15-5306. For instance, if this corporation intends on applying for Tax-Exempt Status during its lifetime specific language (501 (c)(3) language) may be required on this form. Regardless of whether this example is the case or not, Incorporators are encouraged to seek professional advice before filling out or submitting these articles. 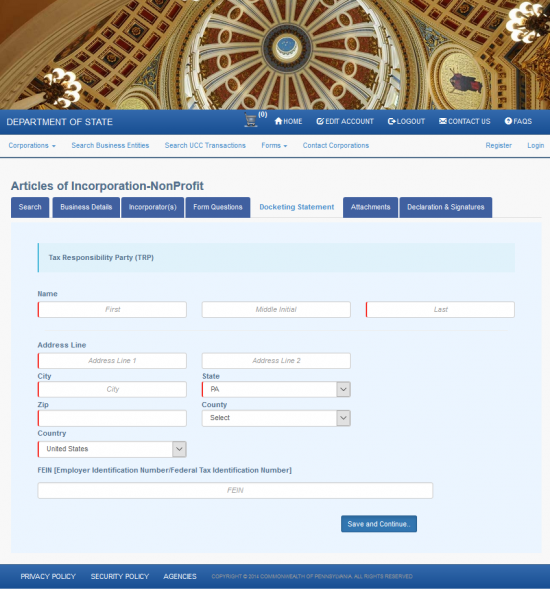 The Filing Fee for the Pennsylvania Articles of Incorporation Nonprofit Corporation | Form DSCB: 15-5306 is $125.00 and may be submitted as a check with a commercially printed Issuer Name and Address made out to “Department of State,” if submitting by mail. If submitting electronically, you will have the option of paying with a credit card. 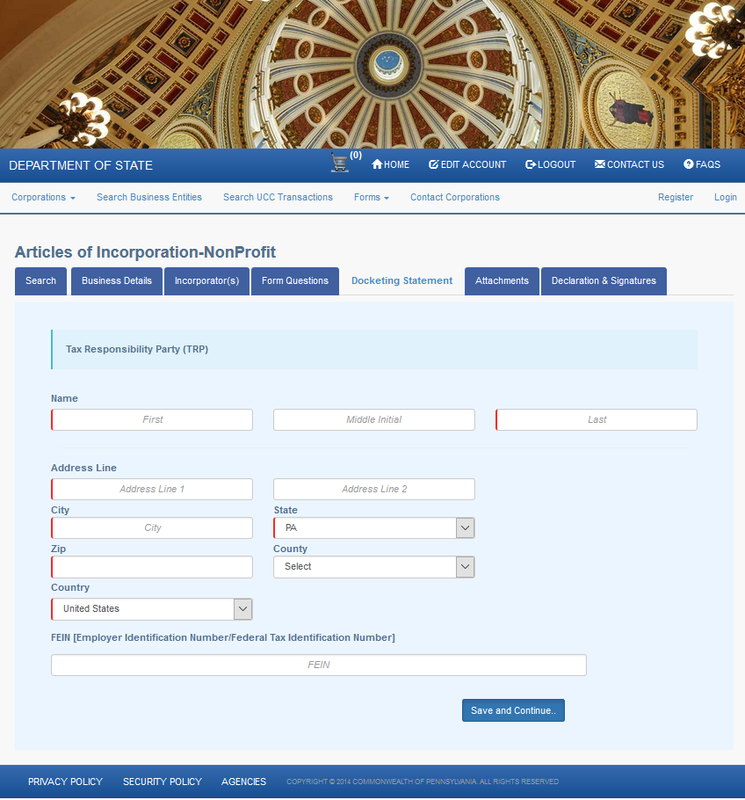 Step 1 - Download both the Pennsylvania Articles of Incorporation Nonprofit Corporation by clicking on the “Download Articles of Incorporation” link above and the Pennsylvania Docketing Statement (required) by selecting the “Download Docketing Statement” above. Step 2 - We will start with the Pennsylvania Articles of Incorporation. Locate the box in the upper left hand corner. You must indicate how you would like the response to these articles to be delivered. If you wish to receive the response by mail then check the first box and fill in the Recipient’s Name and Mailing Address in the spaces provided. If you wish the response to be made via Email then select the second check box and report the Recipient’s Email Address in the space provided. Step 3 - The next step will also require a choice be made. 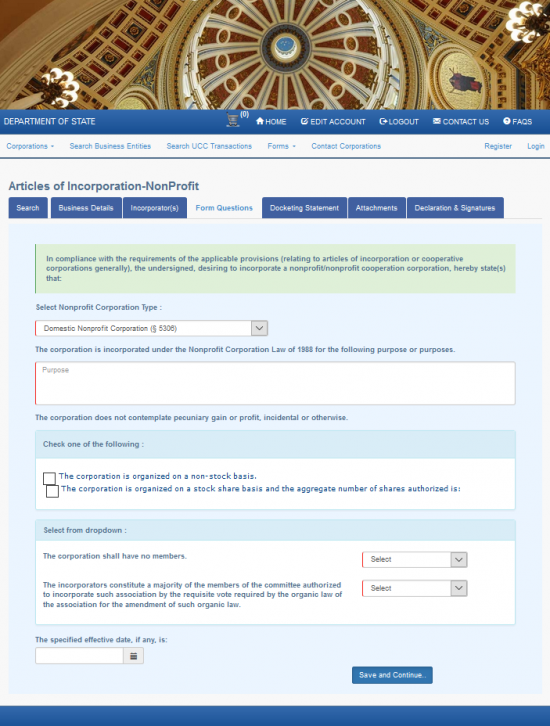 Here, you must specify the type of nonprofit corporation being created by these articles. If this is a Domestic Nonprofit Corporation then place a check mark in the first check box on the first line. If this entity will be a Nonprofit Cooperative Corporation, then check the second check box on the first line. You may only choose one of these boxes. Step 4 - In the first article, Article 1, document the Full Name of the nonprofit corporation being created. Make sure to include any appropriate and required words of incorporation. Do this on the blank space provided in this article. Step 5 - In second article, Article 2, the Registered Office must be reported. This article is divided into two sections, “a” and “b.” You may only fill in one of these sections and this will depend on the type of Registered Agent obtained for this nonprofit corporation. If you have obtained a noncommercial Registered Agent, you must report the Building Number, Street, (if applicable) Suite Number, City, State (must be Pennsylvania), and County of the Registered Office where the noncommercial Registered Agent may be found on the blank line in section 2a. 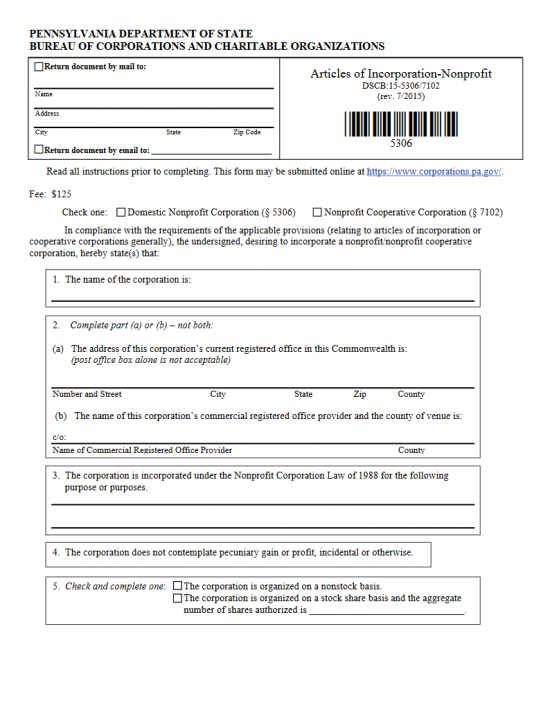 If this is a Commercial Registered Office Provider, then skip section 2a and fill in the Name of the Commercial Registered Office Provider, as well as the County of this party, on the blank space in section 2b. 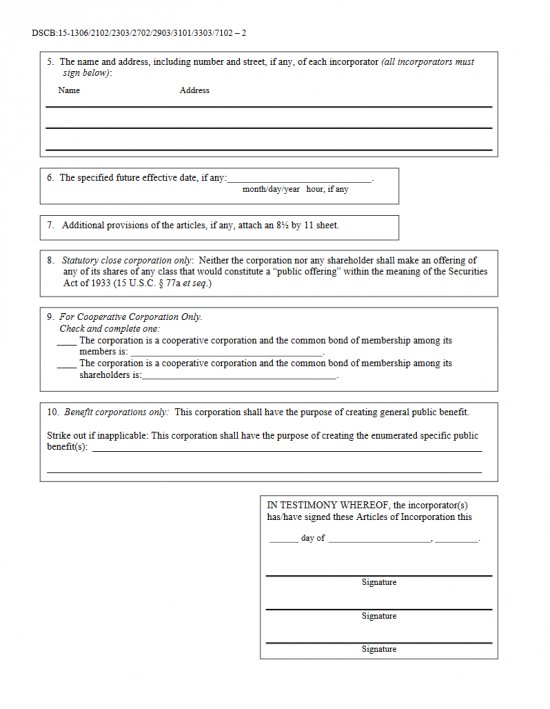 Step 6 - On the blank space in Article 3, document the Purpose of forming this corporation. This may include why you are forming it and how it will operate. 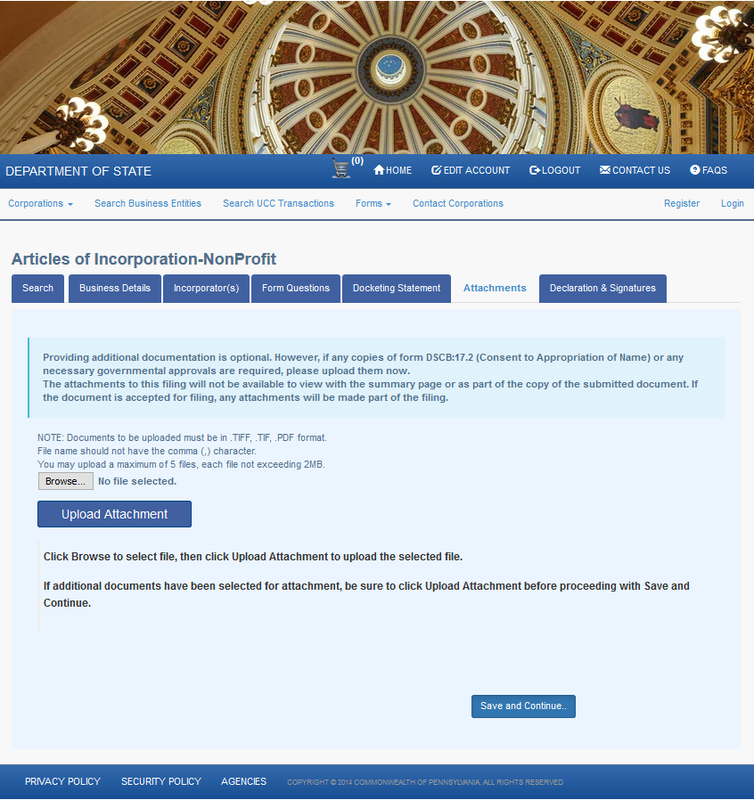 Step 7 - Article 4 will restrict the intentions of this corporation to operate without the expectation or intent of making a profit or retaining financial gain. Step 8 - Article 6 will apply only to unincorporated associations forming a nonprofit corporation. If this is not the case here, you may leave this blank. If this is the case and the Incorporators make up a majority of the committee ruling over association then place an “X” on the blank line in this section. Step 9 - In Article 7, indicate if the forming nonprofit will have members or not. If not, then place an “X” on the first blank line. If so, then place an “X” on the second blank line. Step 10 - If this is a Nonprofit Cooperative Corporation being formed by these articles, then in Article 8 indicate whether the common bond of membership applies to members or shareholders. If it is a common bond of membership among members, then place an “X” in the first blank space and define the common bond. If the common bond of membership is among shareholders, then place an “X” next to the second statement and define the common bond on the blank space provided. Step 11 - In Article 9, you must report the Full Name of each Incorporator as well as his/her/its Address. Each Incorporator should have his or her own line with the Full Name reported on the left and the Full Address of that Incorporator reported on the right. Step 12 - In Article 10, you may choose a specific Effective Date for these articles to go into effect that is after the Filing Date. If this is the case, report the desired Month, Day, Year, and Hour (if applicable) on the space provided. If you wish the Effective Date of these articles to be the same as the Filing Date then, leave this section blank. 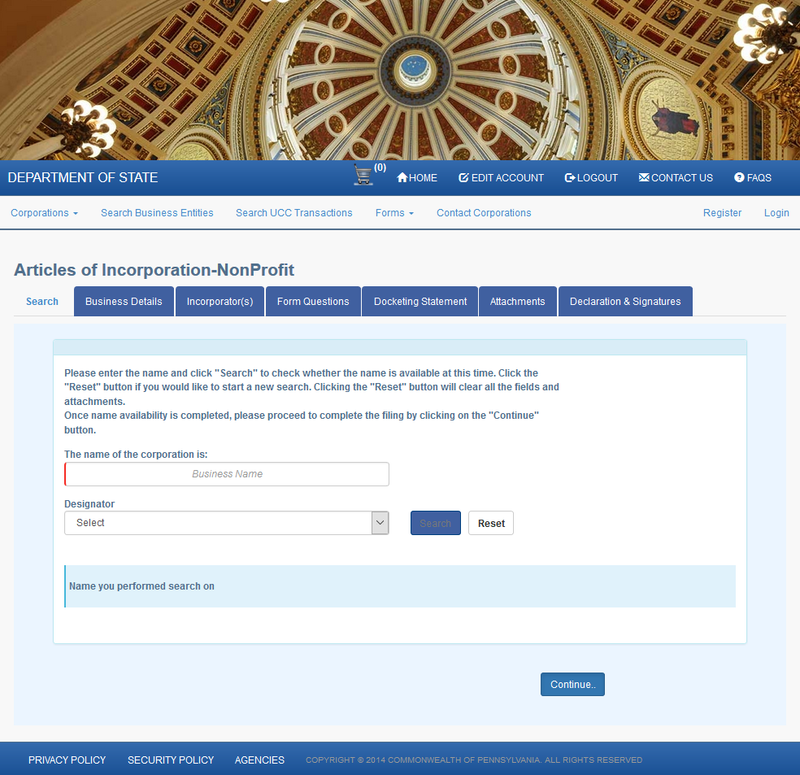 Step 13 - If there are any additional Provisions, Conditions, and/or Comments that must be included so this nonprofit corporation may properly form then you may attach them to these articles as per Article 11. Step 14 - In the box located in the lower right hand corner, document the Date this form is being signed by entering the Day on the first blank space, the Month on the second blank space, and the Year on the third blank space. Below this will be a space for three Incorporators to sign their Names however if there are more listed, all must provide a Signature. If this is the case, then attach a separate document bearing these Signatures. Step 15 - Next, you must fill out the Docketing Statement. Here you will need to fill out your contact information, the Full Name of the Entity, the Full Name and Address of the individual responsible for filing the Initial Tax Reports, and a Description of the forming corporation’s activities. 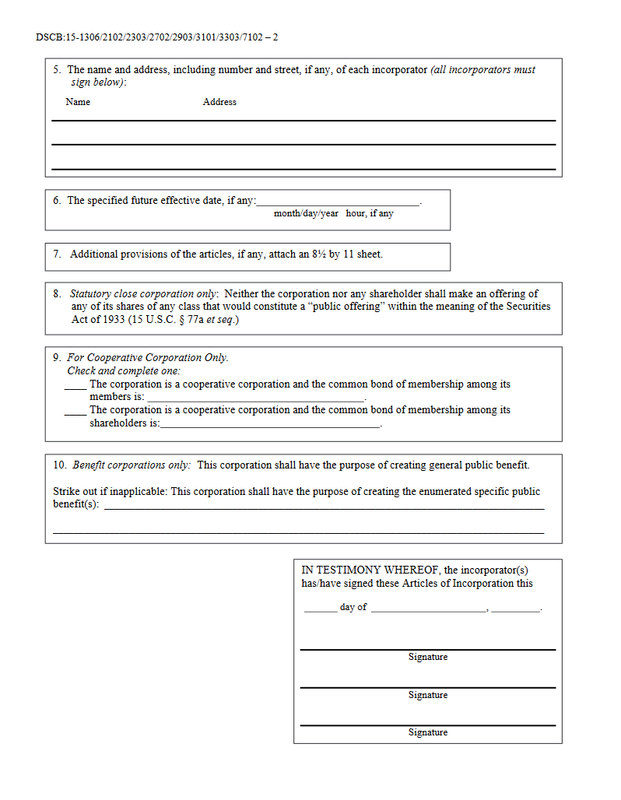 Step 16 - Organize the Pennsylvania Articles of Incorporation Nonprofit Corporation | Form DSCB: 15-5306, the completed, Pennsylvania Docketing Statement, all required documents (paperwork, additional filings, licenses, etc.) into one package with a check made out to “Department of State” for the amount of $125.00. Step 1 - Go to the login page for the Pennsylvania Bureau of Corporations and Charitable Organizations here: https://www.corporations.pa.gov. You must either create an account and login or login to use this system. Step 5 - From the drop down list labeled “Name,” select the Name of the Registered Office Provider the forming entity has acquired. 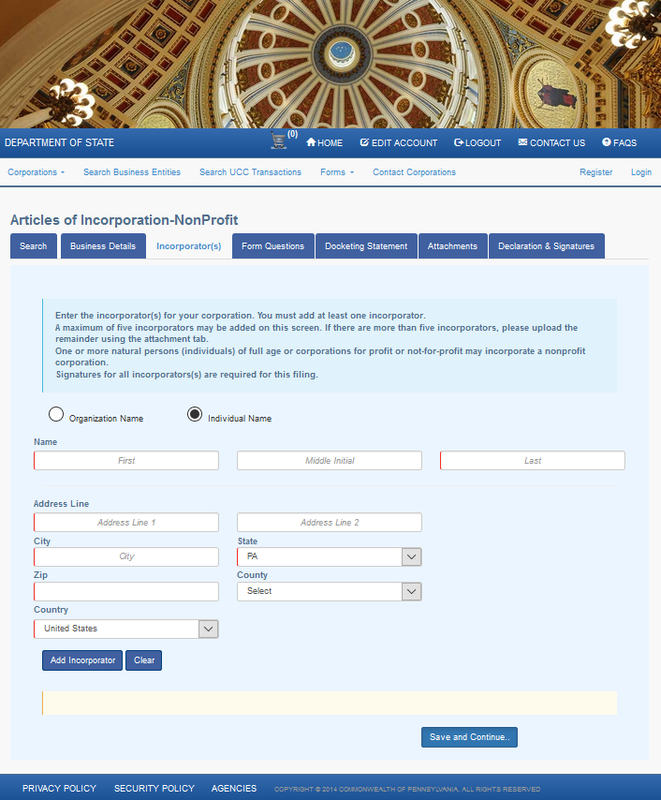 Step 8 - Enter the Full Name of an Incorporator using the fields provided (First, Middle, Last). Step 9 - There will be two fields which may be utilized to report the Incorporator’s address. This must contain a Building Number, Street, and (if applicable Suite Number). Step 10 - Enter the City used in the Incorporator’s Address. To the right of this, select the State from the drop down list provided. Step 11 - Next, enter the Zip Code in the field labeled “Zip.” To the right of this, select the County from the drop down list provided. Step 14 - In the field below the words, “The corporation is incorporated under the Nonprofit Corporation Law of 1988 for the following purpose or purposes” report the Purpose of the forming nonprofit corporation. Step 15 - Below the words “The corporation does not contemplate pecuniary gain or profit, incidental or otherwise,” you must select one of two radio buttons to indicate if this corporation is organized on a nonstock basis or on a stock share basis. If the forming corporation is being created with no authorized stock available then select the first radio button. If this corporation will have authorized stock to issue, select the second radio button then enter the Total Number of Authorized Shares in the field that appears. Step 16 - If this nonprofit corporation will not have members then select the word “Applicable” from the drop down list next to the words “The corporation shall have no members.” If this corporation will have members then select “Not Applicable” from the drop down menu provided. Step 20 - On the Address Line, enter the Building Number, Street, and applicable Suite Number of this individual. Step 21 - Next enter the City, State, Zip Code, County, and Country of this individual in the remaining fields. Note: State, County, and Country are drop down lists. Once you are done select the “Save and Continue” button. Step 22 - If any documents must accompany these articles then locate the “Browse” button on the Attachments page. Use this button to locate the PDF, TIFF, or TIF format documents that must accompany this form. Once you have done so, you may use the “Upload” button to attach that document to these articles. Select “Save and Continue” when you are done. Step 23 - The Declaration and Signature page requires that each Incorporator listed in these articles provide his/her/its signature in the text box using that party’s Name as a label. Once each Incorporator has entered his/her Name, select the “Review Filing” button. You will have one opportunity to review and edit your information. Once you have done so you may submit the articles. This will guide the browser to an area where you may remit a payment by credit card.